Three HomeFi: A compelling alternative to fixed line broadband? Three wants you to cut the cord on home broadband and get internet over the air with its HomeFi package. But is a mobile network up to the job of serving home users? We’ve been spending some time with HomeFi to see whether it really is a viable alternative to fixed line broadband ISPs. HomeFi is a home broadband service that provides internet over Three’s cellular network, instead of the fixed line connections used by almost every other ISP. It costs £24 per month for 40GB data, with the option of a 12 month contract (with no upfront costs) or rolling monthly deal (the latter of which has a one-off charge of £59.99 for the hardware). There are several reasons why this makes a compelling alternative to a mainstream home broadband deal. For starters, there’s the speed. We know mobile networks are capable of high speed access which can exceed many home broadband services. The most recent Ofcom Smartphone Cities results showed Three managed an average 4G download speed of 18Mb. That's quicker than the average UK broadband speed of 16.3Mb in the Q4 2016 Akamai State of the Internet report. It would be welcomed by anyone using an ADSL broadband connection, where the actual peformance often falls far below the theoretical 17Mb maximum. Not having to worry about fixed lines also affords a great deal more flexibility. Moving home is a little simpler since there’s no need to transfer contracts or cancel and activate new lines. It doesn’t require any drilling or fixing boxes to the wall. And if you don’t make voice calls there’s no need to pay for line rental. Another advantage of the HomeFi is that it’s incredibly quick and easy to setup. Inside the box you’ll find the 4G router, power adapter and ethernet cable. 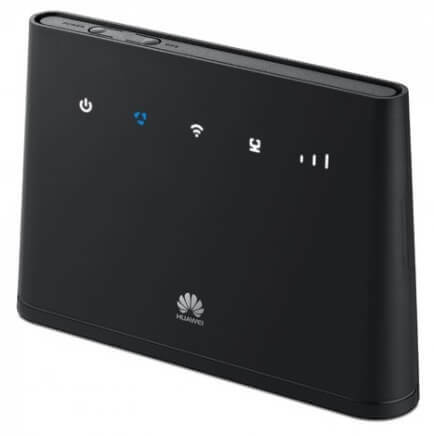 The 4G device resembles any other home broadband Wi-Fi router, with the addition of a signal strength indicator on the front and SIM card slot in the rear. With the SIM inserted and the power connected it takes just a minute or two to locate a mobile signal, then you’re ready to go. It’s a marked difference compared to the weeks of setup time of a typical home broadband service, and the whole process is simple enough that anyone can be up and running in a few minutes without a single call to tech support. The HomeFi hardware is managed through a web interface or optional mobile app. As always it’s a good idea to login and change both the administrator password and Wi-Fi details before you do anything else. You should also take some time to familiarise yourself with the admin controls. Although the hardware is fairly basic compared to many home broadband routers there’s a reasonably extensive menu of settings to manage the broadband and local network. We tested HomeFi by running speed tests in several locations. The tests were conducted at different times of the day, using both 3G and 4G. In many of our tests HomeFi was quicker than ADSL home broadband, so if you’re in an area without fibre optic internet it could be the fastest service available. Of course, signal strength has a huge impact on mobile broadband performance so your experience will depend on the network coverage. 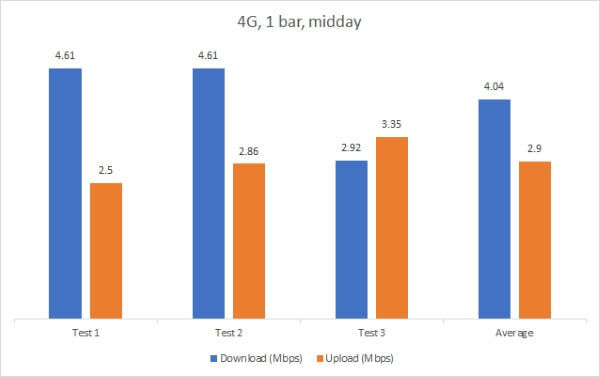 At midday in an area with poor signal (just one bar out of four as per the signal strength indicator in the admin controls) we recorded an average 4G download speed of 4.04Mbps. But another test at the same time in a location with three bar strength gave an average download of 17.88Mbps. 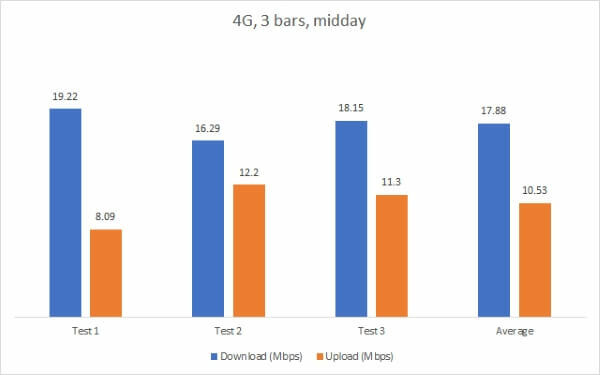 When it comes to 4G vs 3G, the good news is that you don’t necessarily need to have a 4G connection to get decent broadband; the single best speed we recorded was an average 21.54Mbps on 3G. 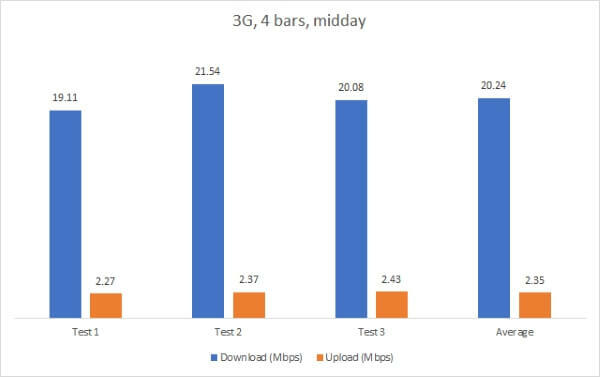 However, there is a big difference in upload speed - none of our 3G tests exceeded 2.44Mbps upstream, while on 4G it was as high as 12Mbps. It's worth noting that the HomeFi router does have two antenna ports underneath a cover on the back. If signal is weak then attaching external antennas should provide a significant speed boost. Should you buy the Three HomeFi? Going by speed alone, HomeFi offers a very compelling alternative to fixed line broadband. It’s easily capable of outrunning ADSL broadband on both 3G and 4G, and even compares favourably to some entry-level fibre optic packages. There’s also no need to pay for telephone line rental, and it’s relatively portable for a home broadband service. Moving home is not a big deal either, and there’s the option of a monthly contract if you don’t want to sign on for a long term agreement. But the monthly data usage cap may be a hindrance. 40GB per month is sufficient for a couple of people using the connection for web browsing, email, social media and other lightweight activities, but as soon as you add in more demanding file downloads or video streaming, or share the connection among several users, it’s going to feel very limited. HomeFi is flexible, easy to use, and can be fast. But unlimited home broadband packages are available for roughly the same monthly cost so anyone considering signing up for HomeFi should think about how the connection is going to be used, and whether they’re going to get better value out of an unrestricted fixed line service.